We’d love your help. Let us know what’s wrong with this preview of Entrapped by Casey Odell. The mark on her arm is slowly consuming her, body and mind, Claire finally has a clue to her mother’s whereabouts, and she won’t let anything stand in her way this time. Not even the Syndicate, the fact that it could be a trap to lure her out of hiding, or the seemingly insurmountable mission she is currently tasked with: to find the other Star Children while she still can. To ask other readers questions about Entrapped, please sign up. I would love to know if and when the third edition to cursed magic will be out? It just seems as though we the fans have been left hanging,do you intend on writing a 3rd installment as first planned or have you now abandoned the series? Just curious so I don't waste your time or mine waiting for something that isn't coming. Patrisha Published December 28th 2015.... omg its finally here!!! Wow! This one is a whirlwind, but overall much less painful to go through than the second book (gah that one was heart-wrenching.) Entrapped moves very quickly; there is a TON of plot development/advancement, much to my delight after the long but unavoidable wait. There is a lot of action and moving around (it really is not fun to be jerked around, Ms. Casey!) but we also indirectly learn more character development. I am loving how Claire is changing after all she has been through so far. Overal Wow! This one is a whirlwind, but overall much less painful to go through than the second book (gah that one was heart-wrenching.) Entrapped moves very quickly; there is a TON of plot development/advancement, much to my delight after the long but unavoidable wait. There is a lot of action and moving around (it really is not fun to be jerked around, Ms. Casey!) but we also indirectly learn more character development. I am loving how Claire is changing after all she has been through so far. Overall, this one is an especially exciting read. Is there a book 4 to this series? Would love to find out what h s opens to Claire, Farron and the re d t of the characters. I enjoyed the series even though it became a bit sluggish in see some areas. It seemed to be dragged out at times. I have waited a long time for this book to come out! Hopefully the next one comes sooner than this one did! I really like the series but it is hard to wait so long in between books. The often roll my eyes at Claire and I want to shout at her for the way she has been treating farron, even though she’s doing it to keep him safe! This story it's a great continuance too book two. The elves, ventures and the group's of people after Claire make you wonder what will happen next. It's a good magical story. Well Claire, I hope you know what you are doing. Glad she finally accepted that Farron wants to be a part of her life,and that she figured out her feelings. Just hope she finds answers before it's too late. I am giving it 3 stars because the ideas are great but the story is not as well told in this one and Claire is getting on my nerves. Farron is still my favorite character even though his part is becoming predictable. One more book to go hopefully the series wraps up well. Can not wait for the next one. I need answers to lots of questions and dying to find out about the heroes and the villains. I love this series by have to go slow since I’m worried that it will end too quickly. 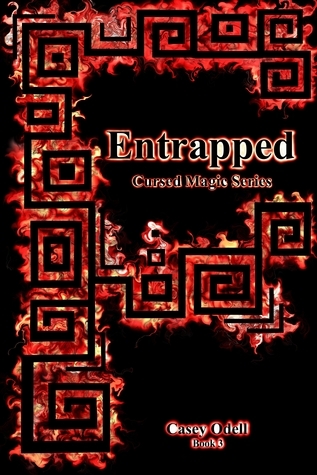 Entrapped by Casey Odell is the last book in the Cursed Magic Series. This story is mostly about an adventure with two purposes, find Claire’s mother and to find the rest of the Star Children so the attacks on the villages stop. On Claire’s journey, Farron, a general, and four of his men are her companionships. Claire finally has a lead on where her mother may be, but it could lead them to find her, or lead them into a trap. On the journey they are attacked by the Syndicate and by a madman, who Entrapped by Casey Odell is the last book in the Cursed Magic Series. This story is mostly about an adventure with two purposes, find Claire’s mother and to find the rest of the Star Children so the attacks on the villages stop. On Claire’s journey, Farron, a general, and four of his men are her companionships. Claire finally has a lead on where her mother may be, but it could lead them to find her, or lead them into a trap. On the journey they are attacked by the Syndicate and by a madman, who is just like Claire, a Star Child. Romance, survival, loyalty, war, death, and so much more take place. I liked the adventure and the not knowing what's going to happen next in this book. I also liked learning more about Farrons past and that we meet Claire’s biological mother. I don't know if I’m happy or disappointed on how the story ends. It's one of those endings where it’s good, but there's so much more that's going to happen and you have no clue if it all will be accomplished. It was kinda sad finding out that Claire’s going a little mad because her mark, but it adds a twist to the story making it interesting. I would recommend this book to those who like to read books that have adventure, romance, and war. Ich habe lange auf das neue Buch der Reihe gewartet. Und dann hatte es alles, was man erwartet und mehr ... ! Claire und Farron machen sich mit einer kleinen Gruppe an Soldaten auf die Suche - offiziel nach den Sternenkindern, aber eigentlich sucht Claire nur nach ihrer Mutter. Sie will sie unbedingt finden, bevor die Magie die Kontrolle über sie erlangt. Natürlich ist das alles nicht so einfach, wie man sich das wünscht. Und auch wenn Claire nicht damit gerechnet hat, das alles gl Wo fange ich an? Natürlich ist das alles nicht so einfach, wie man sich das wünscht. Und auch wenn Claire nicht damit gerechnet hat, das alles glatt geht, kommen doch neue Spieler auf das Feld und überraschen sie. Zum Beispiel ein verrückter Mann, eines der Sternenkinder, der möchte, dass Claire zeigt, was sie kann und nutzt dazu alle Mittel. Das Syndikat taucht natürlich auch auf und am Ende sogar wieder die Zentauren. Das Buch hat hat unglaublich viel Action. Es spielt kam zehn Seiten am gleichen Ort oder wenn, dann wird gekämpft. Es gibt wirklich alles: Spannung, Action und Romantik. Und das ist mir am Ende wirklich viel geworden. Ich will nicht sagen zu viel - aber es ist aufgefallen. I love this series however this book dragged a bit. The first 40% of the book was more of a tug of war about Claire's feelings for Farron. Then after it got into a bit of action. I fell in love with Farron from the beginning and this book makes you fall all over again. I am really looking forward to Claire's journey ahead..I just hope it doesn't take two years to find out. Unfortunately, the authors style is unimproved with time and the story's pacing is uneven and fitful. I continue to read, because the idea is good and I wish to see how it is resolved, but I continue to be disappointed by the lack of storytelling. I hope that this author continues to grow and tell her stories, because she has potential that is, as yet, unfulfilled. I started reading this series a couple of years ago. Easy reads but a very sweet story. There are definitely some issues with the writing, though. Definitely missing some character development, but I can't wait to see what the author does if she keeps writing and growing. Please Tell Me There is a 4th!!! I love Casey O'Dell's works! I have reread books 1 and 2 and have just finished book 3. I am hungry for more!